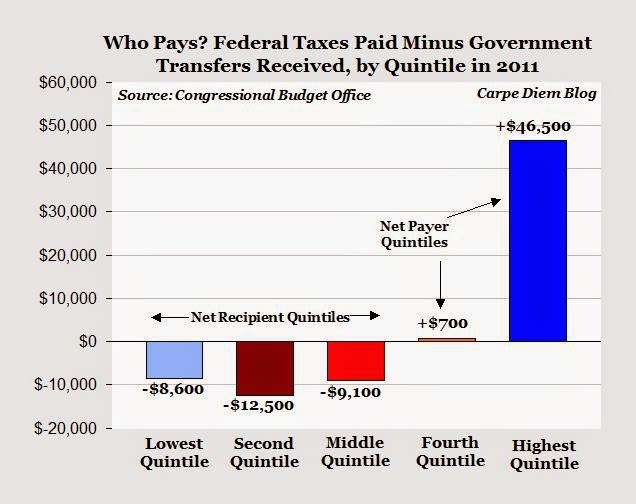 "Quintile" means divide the population up into 5 equal sized groups using a variable -- in this case income. The same number of Americans are in each of those 5 groups, roughly 64 million people each. This chart makes the decline of America extremely easy to understand. Want to place any bets on how "sustainable" this is? On average, if you make much over $100K, you pay something just below $50K into the FEDERAL government. What the chart doesn't show is that you ALSO pay something close to 10% of your income into the STATE if you live in a blue or purple state. If you don't feel like a tax slave, you need to look at the chart a while longer. Any one having trouble understanding why our workforce participation rate is the lowest since the '70s? People pull that train for a few years and they figure out that the cars behind are a lot more comfortable than the providing pedal power for engine. Other small fact -- notice that "The Party" (TP-D) doesn't throw the most money to the bottom -- the votes are in the 2nd and 3rd quintiles! The folks at the very bottom are often too old or too unmotivated to even do the handed to them mail in vote, so the money goes to those that make from $20-$62K ... the fact that more per capita goes to the $38K-$62K group than to the 0-$20K group would be especially galling to anyone that cared about "the poor" more than votes! I case you are reading this and saying "but I pay income taxes", remember that this is NET -- if you get FICA, housing assistance, BOcare, Earned Income Credit, etc, that is deducted from what you "pay". The linked article has one more fact worth repeating --- 40% of US households now get more than HALF of their income from transfer payments!